The American Heart Association meeting in Orlando was amused recently by a University of Wisconsin study indicating that two 12-ounce glasses of the Irish pub favorite may both thin the blood and slow the deposit of cholesterol on artery walls. Alcohol and anti-oxidants resulting from a room-temperature brewing process may mean a discarded ad slogan from the 1920s is right. 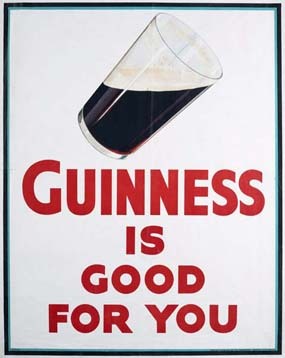 In English-style ales and stouts such as Guinness, alcohol is produced by yeast digesting sugars at near-room temperatures. This is why it's relatively easy to make your own, as in this classic Good Eats episode, called Amber Waves. Most German-style lagers, on the other hand, produce alcohol at very low temperatures. German brewmasters took their recipes around the world in the 19th century, resulting in industry-produced brews as diverse as America's Budweiser, China's Shingtao and Jamaica's Red Stripe that all taste pretty similar. OK, I'll admit it. I prefer Guinness for the taste. To celebrate the brew's 250th anniversary, the brewery recently sent out a limited edition of barrels carbonated by carbon dioxide rather than the nitrogen Americans are more accustomed to in their pubs and cans. The resulting brew tasted as light as Coca-Cola to me, and coming from an Atlantan this is high praise. About the only disquieting element here is the dosing. Guinness bottles usually contain just 11 ounces of the brew, while cans and pubs deliver 16.9 ounce half-liters. Two typical bottles of lager, on the other hand, deliver exactly 24 ounces. NOTE: The story on which this report is based was written in 2003.